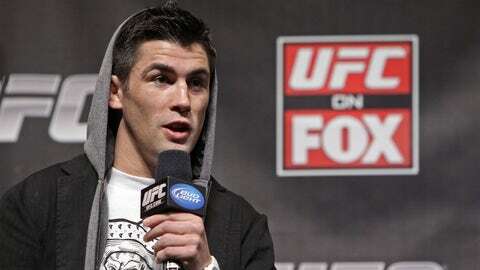 Dominick Cruz and Renan Barao square off at UFC 169 for the bantamweight title. Someone’s ridiculous winning streak will have to go at UFC 169. The event’s fight poster, released this week, shows a pair of champions – Dominick Cruz and Renan Barao - facing off. The two will meet in the main event in Newark, N.J., on Feb. 1 to unify the UFC bantamweight title. Barao, the interim champion, is unbeaten in the last eight years, while Cruz hasn’t lost in the last six years. Cruz, however, was out for more than two years due to a pair of knee surgeries. He’s looking to prove himself as the sole owner of the belt. Another excellent title fight, the featherweight bout between Jose Aldo and Ricardo Lamas, gets second billing on the poster. It’s the co-main event, but nothing about that fight - and the incredible Aldo - deserves a runner-up slot. It’s going to be a blockbuster event the weekend of the Super Bowl.